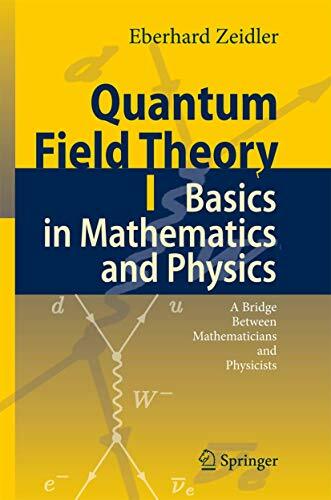 This is the first volume of a modern introduction to quantum field theory which addresses both mathematicians and physicists, at levels ranging from advanced undergraduate students to professional scientists. The book bridges the acknowledged gap between the different languages used by mathematicians and physicists. For students of mathematics the author shows that detailed knowledge of the physical background helps to motivate the mathematical subjects and to discover interesting interrelationships between quite different mathematical topics. For students of physics, fairly advanced mathematics is presented, which goes beyond the usual curriculum in physics. Prof. Dr. Dr. h.c. Eberhard Zeidler works at the Max Planck Institute for Mathematics in the Sciences in Leipzig (Germany). In 1996 he was one of the founding directors of this institute. He is a member of the Academy of Natural Scientists Leopoldina. In 2006 he was awarded the "Alfried Krupp Wissenschaftspreis" of the Alfried Krupp von Bohlen und Halbach-Stiftung. The author wrote the following books. Springer Verlag New York, 1984-1988 (third edition 1998). Applications to Mathematical Physics, 2nd edition, 1997, Springer Verlag, New York.